Gamers queued up to ask an expert panel of writers from Wired, Joystiq, Time Magazine, Crispy Gamer and even the Escapist questions on topics as diverse as ethics, getting started in the industry, the nuts and bolts of working as a gaming journalist, and even their thoughts on Metacritic. Gaming journalism is a lot of people's dream job, but there's a lot about the industry that people don't know, and so the opportunity afforded to PAX East attendees this afternoon, as they got the chance to ask experts in field a whole heap of questions. The panel consisted of Chris Grant, Editor-in-Chief of Joystiq; Gus Mastrapa, who has written for Hustler, Wired and the Onion, to name a few; Lev Grossman of Time Magazine; our very own Senior Editor Susan Arendt; and Kyle Orland, most recently of the ill-fated Crispy Gamer. The most obvious question - how to get a job in journalism - was pre-empted by the panel with their introductions, as they described how they got started in the industry. Despite the varied paths they took, a willingness to put a lot of work in, whether it was maintaining a blog or writing for a local paper or sending pitch after pitch to editors, and having the determination to keep going, sometimes for years, before they got a break was common to all of them. "I was waiting for the gaming industry to find and discover me, because I was that damn awesome," said Susan Arendt wryly, speaking of how she got her start in the industry, "[but] waiting for [gaming journalism] to come to me [was] not getting it done." The panel took questions via twitter, DS Room, and the old standard of people lining up for their turn on the microphone. The questions came in two varieties: Questions about the day-to-day business of a freelance writer; and wider questions about gaming media as an industry. When it came to the minutiae of gaming journalism, the panel were happy to shed light on a part of the industry that people rarely see. The audience had questions on a range of topics, from whether freelance reviewers get review copies of games (sometimes) to whether it's possible - and important - to hold down a regular job as well as a freelance job (yes and yes) to how to talk to get editors (politely and without being crazy). The importance of perseverance was reiterated, and that maintaining a blog of your own was a great way to hone your writing skills, as well as building up a body of work to show potential employers and that while doing something unique was probably the best way of getting noticed, having a strong voice was just as important. Gus Mastrapa also said that the traditional roles - such as dedicated copy editors and researchers - were vanishing form the industry, which put the onus back on writers to make those skills part of their repertoire. "There used to be a person whose job that was, the guy in the fact checking department who was really good at that, so you could not have to sweat those details ... [but] it's going to be on you to do it now." Chris Grant added that the more a writer could do themselves, the better: "If [an editor] can spend one minute on your story, instead of ten minutes, that's a major bonus." The panel also talked about some of the skills and qualities beyond writing well that were useful when trying to find work in the industry saying that skills like working with HTML or Photoshop, or the ability to take good pictures can help you because they make your more valuable to an editor, and that simply being easy to get along with can take you a long way. Susan Arendt also noted that having passion and enthusiasm for games was very important, and that in her opinion constantly being scathing and sarcastic didn't make a good writer: "If you never show love for this, please don't waste my time. "Interestingly, something the panel didn't consider to be vital, was a college degree, and that while it was a good place to get certain skills, actually having the skills was more important, and they could be picked up elsewhere. The audience were also keen to know the panel's thoughts on the bigger issues of gaming journalism. Professional ethics is a sticky subject in our industry, and the panel acknowledged that the relationship between gaming journalism was often a strange one, due to the dependence of journalists on developers and publishers and on the PR machine that rolled out press releases and the panel felt that in a situation such as this, disclosure was utterly vital. "I wish more outlets talked about [their ethics]," said Chris Grant, "I wish they were more blunt about what they didn't allow." Kyle Orland agreed with Grant saying: "As long as you disclose where you're coming from and what you got for free; if you're comfortable telling the readers about it and you don't think that they're going to mind , then you're good. If you have something you feel like you're hiding from the readers, that's a probably a bad sign." 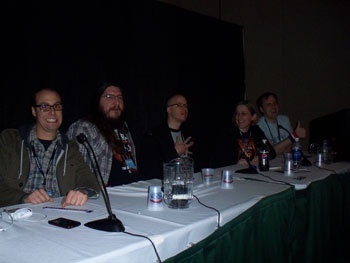 When asked how gaming journalism was changing, the panel thought that it was evolving due to the influence of the connectivity the internet offered. Podcasts and Twitter were giving journalists the chance to connect more with their audience, and the ability to connect with people was a big help in turning gaming journalism into a two-way dialogue. "You have to come armed with all those weapons," said Lev Grossman, speaking about Twitter and podcasting, "because that's what being a journalist means now." "As long as you disclose where you're coming from and what you got for free; if you're comfortable telling the readers about it and you don't think that they're going to mind , then you're good. If you have something you feel like you're hiding from the readers, that's a probably a bad sign." Perhaps that's what drove Dan Hsu for making him writing an article about Editorial Integrity and why he's pissed at the gaming journalism. I wouldn't blame him for being driven up the wall for actually telling the truth behind gaming press. I'm glad I attended this, especially so as a blogger-hobbyist whom is hoping to become more serious about discussing gaming and other related technologies in the future. It was nice to hear how each of the panel started out and it gave me perspective on how best to get on my way, and I find myself in the shoes of the Escapist's own Susan in that I have a simple WordPress blog sitting around waiting to be found by people but slowly I'm attempting to put my stuff out there. I'll figure it out eventually, I'm sure. This is really awesome to read since I think gaming journalism would be a great career, especially since I've wanted to be a journalist for quite a number of years now. I wonder if the Escapist team would do something similar. Like hold a Q&A about what it's like writing for the Escapist and what advice they'd recommend to aspiring journalists. Journalism is certainly evolving, it has to. With te advances in technology it has to change if it still wants to reach all its key audiences. And ethics are always going to be "Sticky" just because talking of it is like bringing up Olitics/religiion ect. People will always have a strong point of view on it. Though, if people could talk about it I am sure it would be less of an issue! So where is the section on their thoughts on Metacritic? I was really looking forward to reading what the journalists thought about it. We didn't have nearly enough time to address a topic that vast, which could be a panel entirely by itself. Thanks to everyone who came out, by the way. It was a lot of fun. Hopefully, I'll get to do it again sometime. Was the panel recorded in any way? I'd very much like to hear it.